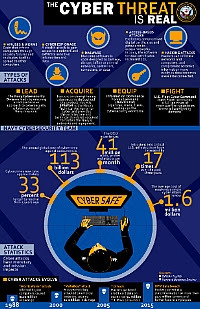 WASHINGTON (NNS) -- October marks the annual cybersecurity education and awareness campaign. As Navy systems and functions become increasingly reliant on cyberspace, adhering to best cyber practices and behaving with integrity online are critical to protecting Navy networks. The cyber threat is real. Between September 2014 and June 2015, there were 30-million known malicious intrusion attempts on Department of Defense networks. Both civilian and military computer systems are under constant attack from a variety of sources. Adversaries use hacking, espionage, malware, viruses and worms to obtain personal information through emails, software downloads and social websites. Whether at work or at home, Navy personnel must remember that they are in the battlespace and are our first line of defense. "What we all have to remember is that every Sailor is cyber warrior," said Chief of Naval Operations, Adm. John Richardson. "Just like every Sailor is a fire fighter, every Sailor is a cyber warrior...It just takes one person to make a mistake; that mistake can be exploited and the network can be severely damaged by one person's lapse in concentration." During October, organizations across the Navy are scheduled to disseminate information through articles, videos, social media and graphics to educate and inform Navy personnel and partners on this vital security issue. "In my role as Navy Cybersecurity director, I am on the hunt every day for capabilities that reduce the risk of cyber warfare disrupting maritime operations," said Vice Adm. Jan Tighe, deputy chief of naval operations for Information Warfare. "A critical step in reducing that risk, and the point of Cybersecurity Awareness Month, is to ensure that every member of our workforce understands their role in mitigating cyber threats. "If you touch a Navy network as a user, maintainer, developer or part of the cyber security workforce, you are in the cyberspace fight. Your actions and behaviors in cyberspace can either enable or prevent adversary opportunity. Since our networks are globally interconnected, it is as important for the shore based Sailor to be cybersecurity minded as it is for those serving forward and on tactical platforms. Cybersecurity is on all of us and all hands need to think cybersecurity, whenever you are interacting with our network." Efforts to drive home the cybersecurity imperative within the Navy will continue beyond October, as the Navy builds on the momentum provided by National Cybersecurity Awareness month, education efforts will continue throughout the next year and beyond. Additional information on National Cybersecurity Awareness Month, including tips and resources for the use of local commands, can be found at a dedicated DHS webpage (www.dhs.gov/national-cyber-security-awareness-month) or on a Department of Defense page (www.defense.gov/News/Special-Reports/0415_Cyber-Strategy). For Navy specific information on cybersecurity throughout the month of October visitwww.navy.mil/local/cyberawareness.